IRONMAN means: 3.8 km swimming, 180.2 km biking and 42.2 km running! 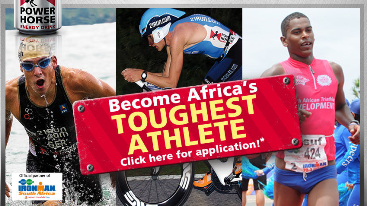 Get a wild card and compete at the hardest triathlon event in Africa! Prepare yourself in a triathlon-specific training camp in February 2013. The Canary Islands will offer optimum training-conditions for the race of your life! POWER HORSE provides: flight, training camp, wildcard for IRONMAN in Port Elizabeth/South Africa, training- /race-outfit and an accommodation! And POWER HORSE is always in your company! Apply to become the one and only – be part & become a finisher! All accurate registrations at www.power-horse.com will be included in the draw. There is no obligation to buy. The winners will be notified in writing. The closing date is the 31th of January 2013. The participants hereby agree to POWER HORSE using the information provided. Regarding the participation of minors, the consent of a legal guardian is required. Employees of the manufacturing company and cooperating companies are not eligible. Winnings cannot be cashed out. The exchange or conversion of winnings is not possible. Any recourse to courts of law is excluded. By entering you accept the rules and regulations of IRONMAN Europe & South Africa and all participating IRONMAN, IRONMAN 70.3 and 5150 Triathlon Series races. POWER HORSE stresses that the personal information of participants will be electronically processed. POWER HORSE is entitled to make information available to third parties, namely cooperation partners. POWER HORSE Energy Drinks GmbH endeavours to provide accurate and complete information on this website. However it does not accept any liability for and provides no guarantee of the currency, accuracy and completeness of the information provided. POWER HORSE Energy Drinks GmbH is not responsible for direct or indirect damages and reserves the right to carry out modifications or supplements to the information provided without prior notification. POWER HORSE accepts no liability for health risks of participants in connection with their participation. Participants are responsible for their own state of health. Participation is at own risk. POWER HORSE also assumes no liability for injuries caused by other participants or outside parties during training and the event. POWER HORSE is not liable for items stored or transported by participants. The use of any brands is not permitted without prior written approval of POWER HORSE Energy Drinks GmbH.